Anyhoo, fast forward a few years and I’m now older, wiser and generally more tired (oh and I don’t compete at anything) so it’s very rare that I’ll train twice a day and I tend to use Sundays as an active recovery day and on the odd occasion I’ll take the active out of it and spend an entire Sunday watching a shed load of TV or Movies on demand. But once again I digress, Matt Damon tends to have that effect on me ..
Where was I? Oh yes, active rest days! As I’ve started running much further and more regularly, my body is still adapting to the stresses off this “new activity” so obviously I’m sore, really sore, in fact I’m so sore that I’ve actually started using a foam roller and a lacross ball to knead out my legs. So really it was not a big surprise to me that today I really “just couldn’t” there are times when you know you’re just being a lazy and times when you know you need to shut up and listen to your body and last night whilst trying to hold back the tears whilst foam rolling I knew that today would be the day I’d have to take my foot off the pedal and have an active rest day. First of all, what’s active rest? Quite simply it means to move at a moderate rate at which you can carry on a conversation easily while doing whatever activity you choose, unless you choose swimming because it’s kind of hard to talk and hold your breath and stuff like that ..
Why should you actively rest? Increasing your heart rate gets blood flowing, which in turn carries nutrients and oxygen to the muscles you’ve been using during training. It also helps flush away waste products, like lactic acid, which builds up following exercise in your muscles. Lactic acid build up is the main reason why your active rest needs to be done at a low intensity as anything above that will produce more lactic acid, which is what we are trying to flush away. What should you do to actively rest? 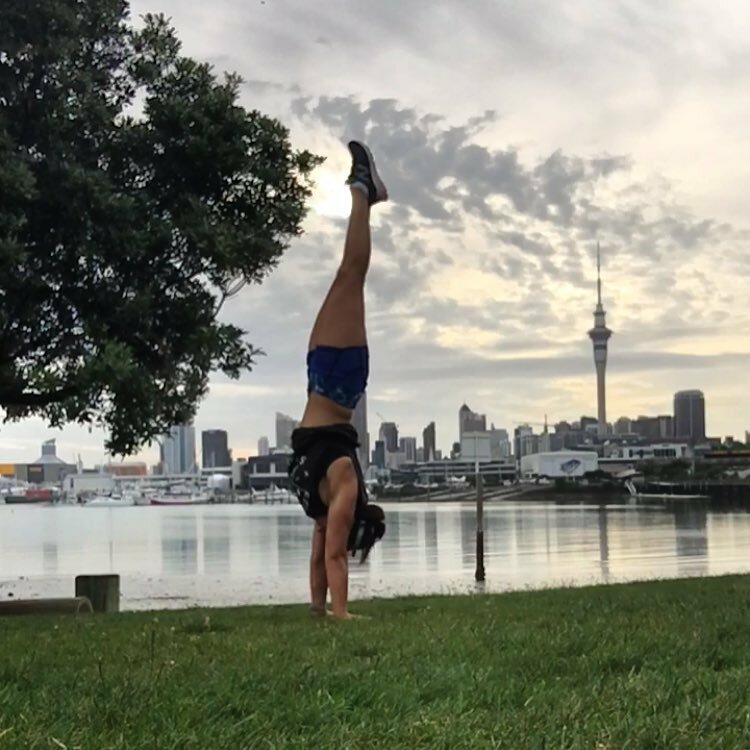 Anything really – I went for a walk around the waterfront and stopped to do some handstands en route, if it was nicer out I could probably could have jumped on my paddle board and pottered around the inner harbour. Ideally you want your active rest days to be an activities that you generally don’t do on a daily basis so if you swim, you may want to go for a walk or if you cycle you could try rowing and everyone of us should try to do more yoga! Speaking of yoga I went to class yesterday, my first in a REALLY long time .. holy tight hip flexors! I guess I’ll be “actively resting” next Thursday at 7:10am in Studio 1 at Les Mills, Auckland City – feel free to come laugh at me join me.